US Secretary of State Condoleezza Rice has pledged support for human rights activists in Moscow, during a Russian visit that has been coolly received. Ms Rice said she wanted to hear from local activists about the state of human rights and democracy in Russia. She emphasised, however, that she had no wish to interfere in Russia's internal affairs. The US has accused President Vladimir Putin of rolling back democracy and trampling rights, charges he denies. One of the activists who met Ms Rice told the BBC she wanted the United States to condemn what she called the Kremlin's stifling of democratic society. The activist said she would tell the secretary of state that Russia is sliding towards an authoritarian regime, where constitutional and human rights are constantly violated. Ms Rice told the activists she wanted to support them, but was also very careful to point out that the US is not interfering in Russian domestic politics but supporting organisations that are entirely indigenous to Russia, the BBC's Rupert Wingfield-Hayes reports from Moscow. US Defence Secretary Robert Gates, who is travelling with Ms Rice, was expected to address military students at the Academy of Russia's General Staff on Saturday. On Friday, talks about US plans to base a missile shield in Eastern Europe ended acrimoniously. The secretary of state was due to have dinner later with her Russian counterpart, Sergei Lavrov, while the defence secretary will meet Viktor Zubkov, the prime minister. Their trip comes as Russia prepares for parliamentary and presidential elections over the next five months. Mr Putin must step down in March after two terms in office. But he has already hinted he may become prime minister and return as president in 2012, as the constitution allows. 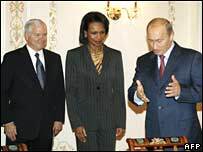 Analysts say Ms Rice's visit to Russian non-governmental organisations could make the Kremlin wary. The Russian Itar-Tass news agency said Mr Putin this week sounded a note of caution about NGOs in comments to visiting French President Nicolas Sarkozy. "It gets really bad, when such organisations start to be used by some states against other states as a tool in pursuit of their foreign policy aims," the agency quoted Mr Putin as saying. Russia is furious at US plans to base an anti-missile system in its geographical backyard, in Poland and the Czech Republic. But the White House team rejected Russian appeals at Friday's meetings in Moscow to halt the scheme. Mr Putin was not convinced by US assurances that the system would be to counteract "rogue" states such as North Korea and Iran. He threatened to abandon a key nuclear missile reduction treaty if Washington forged ahead with the plans.